Guitar Rig Session gives six-string players everything they need to record complete tracks. Robust, compact design. Versatile yet simple connectivity. Bundled software is excellent. Great value for money. Recording couldn't be simpler. MIDI I/O is absent. No bass presets (yet). There's no vocal-specific software. Guitar Rig Session package combines the Session I/O audio interface with a selection of software that's supposed to provide all you need for putting together complete tracks. The hardware is a sleek, black, aluminium-cased unit, sporting one XLR mic input, two switchable line or instrument-level inputs, and stereo and headphone outputs with independent level controls. 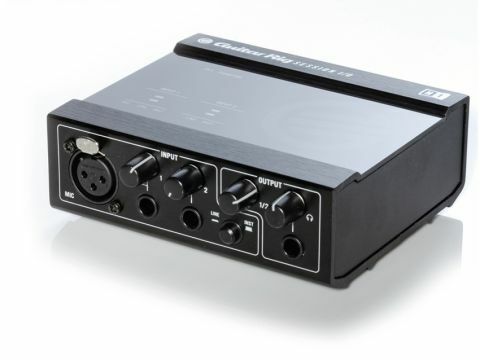 The device is bus-powered by the USB 2.0 connection on the rear, and on top are indicators to show whether you're using mic, line or instrument inputs, and another to show whether phantom power is engaged. For each input channel, a green light indicates signal strength, while there's a red light for clipping. All that's missing is MIDI I/O. The interface works perfectly. Thanks to the unit's Cirrus Logic AD/DA converters, the sound quality is superb, with the device supporting up to 24-bit/192kHz quality. Guitar Rig 3 XE is a stripped-down version of the full Guitar Rig 3 software. It has five amplifiers, named Gratifier, Lead 800, Citrus, AC Box and Twang Reverb (we'll leave it to you to suss out which real-world models they're based on). There are also 12 cabinets and 21 effects, including reverb, delays, chorus, phaser, five different distortions, wah-wahs and more. The 'matched cabinets' feature, which automatically selects a cab that suits your chosen amp, helps to streamline workflow, and having limited options means that recordings can be made with a minimum of fuss. You may not find the perfect tone, but you'll get close, and in far less time than if you were to record a real amp. Running in standalone mode, Guitar Rig 3 XE is ideal for sketching ideas, but when it's used as an AU, RTAS or VST plug-in, things become really interesting. By recording the raw guitar input in your DAW, you can change your tone post-take until it's just right. Overall, XE represents superb value for money, whether bought on its own or as part of Session, and owners can upgrade to the full version of Guitar Rig 3 at any time for €199. The included Steinberg Cubase LE 4 is suitable for bread-and-butter recording, monitoring and mixing. Also welcome are the inclusions of both the free NI Kore Player, with its 50 top-quality virtual instrument sounds, and the not-so-free Pop Drums Kore SoundPack, worth €69. Their presence makes it possible to record and mix complete songs. NI are pitching this package at guitarists, bassists and vocalists, but it's six-stringers whose needs are truly catered for. Notably, Guitar Rig 3 XE doesn't contain any bass amps - and there are no bass-specific presets either - but these are on the way in a free update, says NI. At least there's an XLR input, though - NI was criticised for not including one on the Rig Kontrol interface. Guitar Rig Session is perfect for guitarists who are looking to lay down ideas while also having access to the kind of sonic arsenal that would do any vintage amp collector proud. If you plan to play live, though, we'd recommend the Guitar Rig 3 Kontrol Edition, which comes with Guitar Rig 3 and a foot controller for switching patches and controlling parameters. If you plump for Session, you can't buy a controller as an afterthought, because it has no MIDI input.